Guitar String Types - Guitar For Beginners Lessons. Free Guitar For Beginners Lessons! Guitar string come in many different sizes. By sizes I mean the gauge or thickness of the strings. For beginners I recommend I light gauge string because the strings will be lighter and easier to fret. Strings vary between 38 gauge and 56 gauge for the 6th string. A higher string gauge will be thicker compared to a lower string gauge. 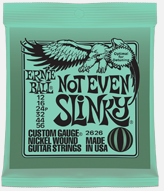 Higher gauge strings are perfect for alternate and drop tuning situations. On the Acoustic Guitar higher gauge strings will give you a longer sustain and a fuller sound compared to a lighter gauge string.